I spent about an hour and a half last week trying to explain to a very intelligent lady who knows nothing about real estate why she needs to have a good, experienced realtor to advise and help sell her house. She assumes, and she is probably right, that she’s likely to get some quick, good offers, and that’s all a realtor would do for her – find a buyer. Yes – but that’s just the beginning. She had never heard of the delicate chain of decisions and milestones which realtors navigate to take a sale from offer to closing, and what could go wrong at any juncture to derail the whole thing. She also hadn’t thought about all the commitments – timetables, plans, deposits… that she would be making after she’s accepted an offer, which may also get derailed, making the whole process horrible, expensive, or stressful for an infinite number of crazy reasons. 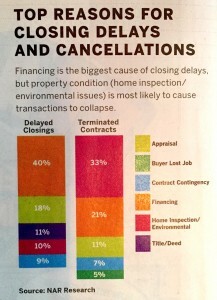 I’ve seen a buyer in Miami get stopped for a broken tail light and get deported the day before a closing, a loan that almost got denied at the last minute because the buyer needed extra cash for a deposit and sold a gun to his buddy, but didn’t get a receipt. A title search revealed that a signature on a 10 years prior sale was missing, and we had to track down the old owners – in Austria – to get the closing done. A lot of our advice is about risk analysis – we advise our clients every step of the way how to plan for these risks, and how to protect themselves from possible consequences. It took me an hour and a half to tell her stories of real situations that blow things up all the time. 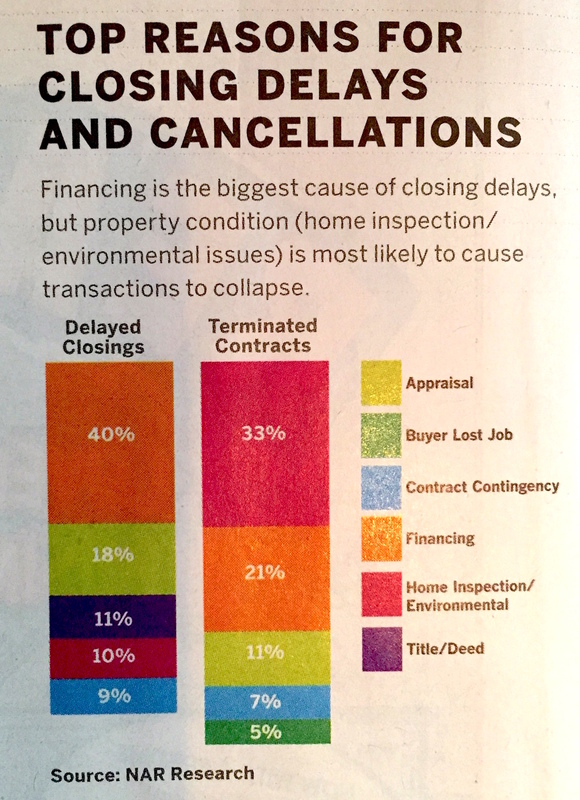 This chart from the NAR shows the (normal) top reasons closings get delayed or fall apart. The details behind these stories can be wild, and our job is to do everything we can to quarterback the transactions to closing. So beware! You need us more than you know!